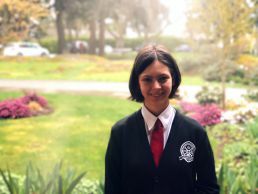 Meet Lindsay Drabitt, Grade 10 student and 2018 Centennial Scholarship recipient. Lindsay is one of the recipients of the scholarship that provides students with up to four years of free tuition and fees. The scholarship is awarded to new students who demonstrate excellence in a combination of academics, leadership, service, and extracurricular involvement. For Lindsay, who considers herself to be the more introverted type, coming to SMS has opened her up to some new interests, including a passion for drama—something most would consider the opposite of introverted. After visiting the campus, coming for a tour, and participating in a shadow day last spring, Lindsay knew St. Margaret’s was the school for her, and that the Centennial Scholarship would be an opportunity to make that a reality. “I really liked the community, everyone seemed friendly and welcoming when I came on my shadow day; I also really liked the smaller class sizes,” she said. Since coming to SMS last fall, the Grade 10 student has made herself right at home, finding her niche among the many extra-curricular activities available. “My favourite part about coming to school here is definitely the clubs I’ve joined—the Genders and Sexualities Alliance (GSA) and the Writing Club. The Writing Club is a very interesting group of students. I also love my drama class, and my teacher Mrs. Paddock. There is a wide variety of extra-curricular here that go beyond just sports,” she continued. For Lindsay, the all-girls environment and smaller class sizes have proven to be truly beneficial. When asked what she would tell new students who are on the fence about applying, Lindsay had only glowing reviews. The Centennial Scholarship is a multi-year scholarship, valued at full day tuition until graduation for students entering Grades 9, 10, 11 or 12. The successful candidate must be a well-rounded individual who demonstrates excellence in a combination of academics, leadership, service, and extracurricular involvement. The selection will be based on all aspects of student life, not focusing exclusively on academic achievement. For more information, contact Gail Bateman, Admissions Assistant or call 250-479-7171 ext 2127. To be eligible, students must be BC residents. Boarding students (5 or 7 day) can still apply but will still be responsible for the boarding component of fees.